My regular readers know that Tinsel & Tine feeds my soul, but that I also have a "day gig" that actually allows me to eat! 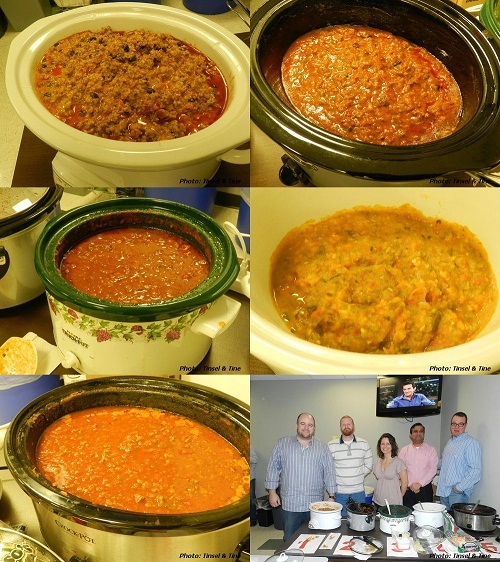 I've just never revealed what or where it was, but the two parts of my life intersected last week when I volunteered to judge our office pre-Super Bowl Chili Cook Off Contest. I wish I could say we fussed and argued and cussed with each other. We could have been divas, bad tempered, whinny, snarky or clueless, but I have to say, there wasn't a Simon, Christina, Adam, Nicki or Britney among us. There was a possible sabotage among the contestants, as someone unplugged Sebastian's crockpot before the tasting, making it necessary for his chili to be microwaved, instead of bubbling hot like the others, but the investigation into who may have pulled the plug is still ongoing. #1 - hearty and delicious, but undecided about the use of sausage as its secret ingredient. #2 - traditional, good n' smokey, burn the back of your throat spicy hot!!! #3 - sweet, full-bodied, smooth, loved the vegetarian beans. #4 - hard to judge it with the others as it was so far from being a traditional chili, but we were pleased with the texture, the tiny chopped up vegetables and the nice mix of indian spices. #5 traditional and rich, it just needed an extra day to sit and have the spices really blend into the chili, the seasoning was just a little bland. Melissa Miller Chili Contestant #3! Melissa works in our Closing Department. She makes this chili recipe for her family at least once a month. Her husband loves it! And the sweet flavor of the chili also makes it a crowd–pleaser for her two young children. for us judges, it lived up to it's name. In a large pot, heat the olive oil over medium heat. Add bacon and cook until crispy and fat renders. Add the beef and cook, stirring until browned. Add onion and cook until softened. Add garlic, chili powder, salt & pepper. Add all remaining ingredients (tom. sauce, worch. sauce, brown sugar, beef stock & beans) and stir. (Toppings: Sour cream-I throw a dollop in each bowl (optional), Pepper Jack cheese/ or just plain old cheddar cheese if you prefer. Cook on low until thick(er). Serve it up baby! Total time is about 30-40 minutes to prepare. If you have a "winning" chili recipe that you'd like to share with Tinsel & Tine readers, send it to me and I'll post it on our facebook page.